The Alphabet Games is a unique non-fiction book series about U.S. Intelligence operatives in their incredibly dangerous and fascinating lives. 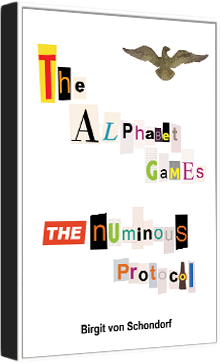 “The Numinous Protocol” is the first book in the series. The James Bond Fantasy is the second highest grossing, 23 movie franchise ever in ticket sales,(beaten only by Harry Potter’ 8 films) so most people have no clues as to the realities of a dangerous, often ugly, thankless, yet vitally necessary shadow wars, nor of the psychological tolls on the warriors and on the people who love them. The Alphabet Games provides some of these real world insights. Well written, at time riveting, often humorous, sometimes disturbing but always thought provoking, the author reveals a NON-PC (politically constipated or full of sh) glimpse of hidden worlds. I hope that the characters survive so there will be many more books in the series. Copyright © 2018 The Alphabet Games. Book Landing Page By Rara Theme. Powered by WordPress.